(northbound); ... Spring Creek Trail path; Poudre River Trail path; Environmental Learning Center lot (gravel) road; ... Drake Road; ... Vermont Drive; ... Power Trail path, (southbound); ... Boardwalk Drive, northwest-bound; ... HMSC. B/■/Moderated pace 22-miler with 450-vertical-feet, east, counterclockwise: ... Trilby Road; Lady Moon Drive; Rock Creek Drive; Ziegler Road; ... Timberline Road (U_turn); ... Harmony Road; ... HMSC. A/♦/Advanced pace 26-miler with 540-vertical-feet, east-to-northeast, figure-eight: ... Trilby Road; Lady Moon Drive; Rock Creek Drive; Ziegler Road; ... Timberline Road; Mountain Vista Road; Turnberry Road; Richards Lake Road; Giddings Road; ... Timberline Road; Harmony Road; ... HMSC. Afterward, an informal gathering at Ryan's Sports Grill, 925 E Harmony Road, Harmony Market Shopping Center. A/♦/Advanced pace or B/■/Moderated pace 24-miler with 1970-vertical-feet. Location: JJ's Country Corner, 4015 S. Taft Hill Road, northwest corner at Harmony Road, Fort Collins 80526, east side area. County Road 38_E; County Road 23 across (three) Horsetooth Reservoir dams; ... Bellvue loop; ... Centennial Road over (two) Horsetooth Reservoir dams; County Road 42_C; Overland Trail street; ... "JJ's Country Corner". Bike (marker) lights are recommended. Meets on the lawn, just south of Ammons Hall, Welcome Center of Colorado State University. B/Blue_Square/Moderated-pace 21-miler with 550-vertical-feet, looping southerly clockwise: ... Power Trail path; Lemay Avenue; Fossil Creek Trail path; Cathy Fromme Prairie Natural Area path; ... Horsetooth Road; ... CSU. Briefing at 11:00 AM, Sunday. B/■/Moderated pace or A/♦/Advanced pace 49-miler with 2150-vertical-feet. Route: south and clockwise loop: ... Boyd Lake Avenue, Loveland; ... Sedona Hills; ... Masonville; ... Harmony Library. A/♦/Advanced pace 25-miler with 1350-vertical-feet: out-to-Horsetooth Reservoir, Inlet Bay; Soderberg Open Space trailhead lot; then, back. [Map: https://ridewithgps.com/routes/27273118]. A/♦/Advanced pace or B/■/Moderated pace 21-miler with 1740-vertical-feet. County Road 38_E; ... west-to-east on Firethorne Drive, Masonville; ... back via County Road 38_E. Route, northwest, clockwise: … Elizabeth Street; Overland Trail (street); Laporte; Poudre River Trail path; ... Mason Street; ... CSU. Meets on the lawn, just south of Ammons Hall, Colorado State University Welcome Center. B/Blue_Square/Moderated-pace 20-miler with 750-vertical-feet: A northwesterly ride with a clockwise loop around the Bellvue-Laporte area. Starting from Colorado State University, south of Ammons Hall; ... Overland Trail road; Bingham Hill Road; 'Bellvue loop'; ... Laporte; ... then, back. 8:45 AM, Loveland Kmart, to arrange carpooling, Sunday. Briefing at 10 AM, at the Fall River Visitor Center, upper parking area, on U.S.34, five-mile west of the town of Estes Park, before the Fall River Entrance to Rocky Mountain National Park. A/♦/Advanced-pace or B/■/Moderated-pace 35-miler with 4550-vertical-feet via Old Fall River Road. or, "Trail Ridge Road" [U.S.34] to Alpine Visitor Center / 43-miler with 5360-vertical-feet [https://ridewithgps.com/routes/27636685]. Potentially stopping at the Café at Trail Ridge; if it is 'open'. 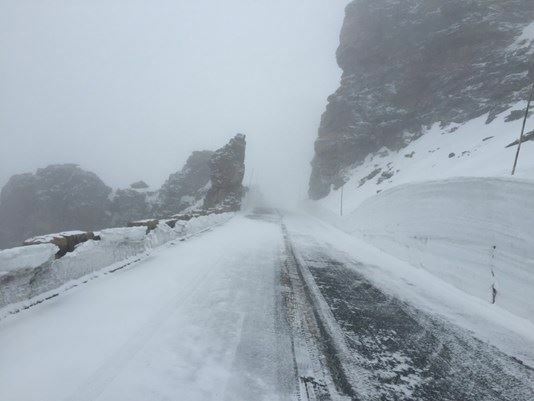 RMNP road conditions report... 970-586-1222. Article on cycling Trail Ridge Road. and, "Old Fall River Road" switchback, (bottom). Location: JJ's Country Corner, 4015 S. Taft Hill Road, northwest corner at Harmony Road, 80526, east side area. B/■/Moderated pace or A/♦/Advanced pace 29-miler with 1500-vertical-feet, southwest, clockwise: ... eastbound on Harmony Road; Shields Street; ... 43rd Street, Loveland; 29th Street, Loveland; Rio Blanco Avenue by Mehaffy Park, Loveland; ... U.S.34, westbound; ... Glade Road; County Road 38_E. A southeasterly, counterclockwise loop, starting from Colorado State University, south lawn of Ammons Hall; ... Mason Trail path; ... Fossil Creek Parkway; ... Lemay Avenue; Trilby Road; ... Strauss Cabin Road; Arapahoe Bend Natural Area (area); Horsetooth Road; ... Drake Road; Power Trail; ... Colorado State University. Briefing at 10:00 AM, Sunday. B/■/Moderated pace, or A/♦/Advanced pace 49-miler with 4300-vertical-feet. A/♦/Advanced pace or B/■/Moderated pace 27-miler with 1550-vertical-feet. Route, southwest, counterclockwise: Along the south side of Horsetooth Reservoir; ... Glade Road; Eisenhower Boulevard; northwestern Loveland; County Road 19; ... JJ's Country Corner. Fort Collins, S-SW, clockwise: Ammons Hall, CSU; ... Mason Trail; ... Wabash Str; ... Spring Canyon Park; ... CSU. Route Description: Looping south-soutwest, clockwise: Ammons Hall, CSU; ... Mason Trail; ... Wabash Str; ... Spring Canyon Park; ... CSU. A/♦/Advanced pace 62-miler with 2000-vertical-feet. Harmony Library, 4700 S Shields Street, 80526, southwest campus car parking area by Front Range Community College (FRCC). Route, south-southwest: ... west from Loveland on County Road 20; County Road 29 to Sedona Hill; ... "The Mountain Fountain," Hygiene/Longmont; ... County Road 16 by Lon Hagler Reservoir; ... FRCC/HL campus, Fort Collins. Briefing at 8:00 AM, Sunday. ... Overland Trail street through Laporte; County Road 56; County Road 19; County Road 68, two-mile gravel; County Road 15 through Waverly; County Road 64 to Wellington (...) convenience store; Colorado 1; west on County Road 54 [Douglas Road]; County Road 17; County Road 56; ... Taft Hill Road; west on Vine Drive; Overland Trail road; ... Front Range Community College/Harmony Library campus, Fort Collins. B/■/Moderated-pace or A/♦/Advanced pace 29-miler with 1500-vertical-feet, southwest, clockwise: ... eastbound on Harmony Road; Shields Street; ... 43rd Street, Loveland; 29th Street, Loveland; Rio Blanco Avenue by Mehaffy Park, Loveland; ... U.S.34, westbound; ... Glade Road; County Road 38_E. B/Blue_Square/Moderated-pace 20-miler with 750-vertical-feet: A northwesterly ride with a loop around the Bellvue-Laporte area. Starting from Colorado State University, south of Ammons Hall; ... Overland Trail (road); Bingham Hill Rd; 'Bellvue loop'; ... Laporte; ... then, back. ■/Blue_Square/B/Moderated pace or ♦/Black_Diamond/A/Advanced pace 48-miler with 1440-vertical-feet. Harmony Library, 4700 S Shields Street, 80526, southwest car parking lot. Route: east-to-northeast-to-southeast, clockwise: ... Ziegler Road; ... Vine Drive; ... Colorado 257 to Windsor; New Liberty Road; ... Highland Meadows Parkway; ... County Road 3; ... County Road 36 to Fort Collins, Kechter Road; ... Trilby Road; Shields Street. June_9th-through-June_15th, a Sunday-through-Saturday (week), 2019. Route, northwest, clockwise: … Elizabeth Street; Overland Trail (street) to Laporte; Poudre River Trail path; ... Mason Street; ... CSU. B/■/Moderated pace and A/♦/Advanced pace 48-miler with 2150-vertical-feet. Loop south and clockwise: ... Boyd Lake Avenue, Loveland; ... Sedona Hills; ... Masonville; ... Harmony Library. "Trek" Seasonal Series, Fort Collins: "Trek," HMSC; ... northwest (A/B), or north (C); ... "Ryan's Sports Grill". Trek Bicycle, south Fort Collins, Harmony Market Shopping Center, 931 E Harmony Road, 80525, southeast of store, car parking lot. Briefing at 5:30 PM; depart shortly afterward. 317 S. Loomis Avenue, Fort Collins, 80521, Old Town West neighborhood. Parking is very limited in the neighborhood! Please, carpool or walk/bike to the start. If you are parking in the alley along the north side of the lot fence; be aware it is first-in-as-last-out! From the alleyway enter via backyard gate. Soft drinks are to be provided by the club. If you'd like to consume "adult" beverages; bring your own. A five-dollar (minimum cash donation) is to be collected at the event from each one there who is to partake-of the food ordered before the rides. Registration is for food preparation purposes; and, will be available June 11th. C/●/Eased pace 12.5-miler with 270-vertical-feet: ... Colorado State University campus; … Prospect Road; Overland Trail (street); Laporte; Poudre River Trail path.../ https://ridewithgps.com/routes/27288635. Ride Leader for C group: Stephen Beckley. B/■/Moderated pace, 49-miler with 4300-vertical-feet. Harmony Library, 4700 S Shields Street, 80526, southwest car parking lot. Colorado State University Welcome Center, (Ammon Hall), south lawn, 711 Oval Drive, 80523. Free parking available after 4 PM in Engineering Parking Lot. Route Description: Looping south-southwesterly, counterclockwise: Ammons Hall, CSU; ... Mason Trail; ... Wabash Street; ... Spring Canyon Park; ... CSU. Begins at (time to be determined), June 29th, a Saturday. Location: Colorado State University, northeast corner of Intramural Fields, Meridian Avenue at University Avenue. This event requires joining our team and fundraising to participate; and, is sponsored by Bike MS, Colorado. B/■/Moderated pace, and A/♦/Advanced pace 48-miler with 1300-vertical-feet. ... Laporte; ... Windsor; ... Fort Collins. Briefing at 7:00 AM, Saturday. A/♦/Advanced pace and B/■/Moderated pace 114-miler with 8200-vertical-feet. (Suggested) all-day parking: High Line Railroad Park, 189 Boreas Pass Road, Breckenridge, 80424, (quarter-mile from start location). Start and briefing location: Sinclair (convenience store parking area, south), 715 S Main Street, (northwest corner of Boreas Pass Road and Colorado_9), Breckenridge, 80424. Route: ... Blue River Bikeway to Frisco; Temple Trail path to near Copper Mountain Resort; Colorado-91 over Fremont Pass to Leadville; U.S.-24 over Tennessee Pass and through Minturn; paths and roads along Interstate-70 through Vail and over Vail Pass to Copper Mountain Resort; Temple Trail path through Frisco; Blue River Bikeway (to return) to Breckenridge. A/♦/Advanced pace and B/■/Moderated pace 52-miler with 1650-vertical-feet. … Trilby Road; … Kechter Road; … Windsor; Colorado_257; Milliken; Johnstown; Colorado_60; ... Boyd Lake Avenue, Loveland; ... Timberline Road; Trilby Road; ... FRCC/Harmony Library campus, Fort Collins. Eased pace/C/Green_Circle/● 14-miler with 230-vertical-feet. Suggested free parking available on campus, Parking Lot 195, west of Moby Arena. The Pavilion, Colorado State University, 920 W Plum Street, Fort Collins, 80521. About-half on paved (city) trails. Route: Laurel Street; ... Spring Creek Trail path; Riverbend Ponds Natural Area; Poudre Trail path; CSU Environmental Learning Center lot; ... Rendezvous Trail path; ... Power Trail path; Stuart Street; ... CSU Annual Flower Trial Garden path; ... Mason Trail path; Colorado State University campus. Ride Leaders and Sweepers: Stephen Beckley and other FCCC pals. For information, email vicepresident@fccycleclub.org or call 970-491-9800. 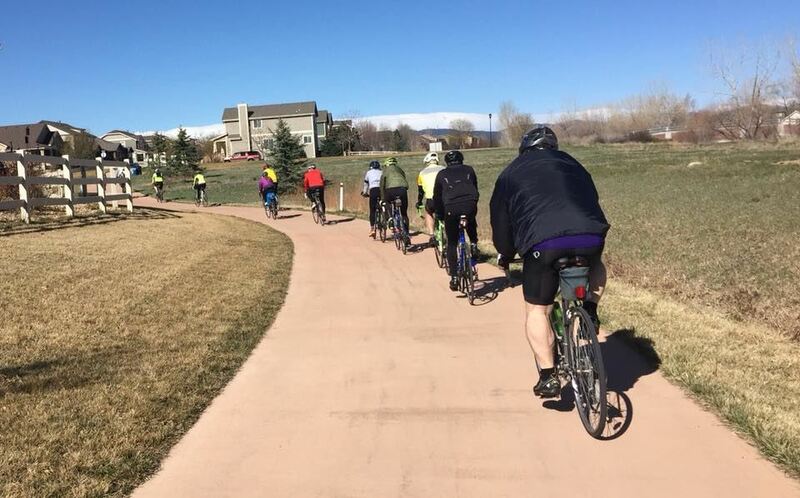 Free after-ride-brunch with pecan rolls from Silver Grill Cafe is to be hosted by Colorado State University at The Pavilion; paid-for by The Natural Path. Location: JJ's Country Corner, 4015 S Taft Hill Road, northwest corner at Harmony Road, Fort Collins 80526, east side area. Fort Collins, east, clockwise: Ammons Hall; ... Environmental Learning Center; ... CSU. "Lakes, Creeks, Rivers, and Sewers": ... Edora Park; Spring Creek Trail path; Riverbend Ponds Natural Area path; Poudre Trail path; CSU Environmental Learning Center lot; ... Drake Road; Power Trail path; Stuart Street; ... CSU. Route, south-southwest: ... west of Loveland on County Road 20; County Road 29 to Sedona Hill; ... "The Mountain Fountain," Hygiene/Longmont; ... County Road 16 by Lon Hagler Reservoir; ... FRCC/HL campus, Fort Collins. Location: Caroline Jannov's. 1455 Bubbling Brook Court, Fort Collins, 80521. A/Advanced-pace 28.4-miler with 1075-vertical-feet; a loop going northwest, clockwise: ... Bingham Hill Road; Bellvue; County Road 54_G to Laporte; ... Douglas Road; Giddings Road; ... Country Club Road; Lemay Avenue; Willox Lane; Shields Street; Vine Drive, west; .... https://ridewithgps.com/routes/28454157. Free soft drinks provided by FCCC: iced tea and soda pop. If you'd like to consume "adult" beverages; please, bring your own (BYOB). Even if it is rainy, and we are not bike-riding; there will be a dinner-social; so, come for that, about 7 PM. A five-dollar donation for food -- lasagna and salad -- is requested from those partaking in the post-ride-dinner; and, it is payable by-cash at the event. A/♦/Advanced pace or B/■/Moderated pace 50-miler with 1370-vertical-feet. ... Overland Trail road; Laporte; County Road 56; County Road 19; County Road 68, two-mile-gravel; County Road 15 through Waverly; County Road 64 to Wellington (...) convenience store; Colorado 1; west on County Road 54 [Douglas Road]; County Road 17; County Road 56; ... Taft Hill Road; west on Vine Drive; Overland Trail road; ... Front Range Community College/Harmony Library campus, Fort Collins. "Trek" Seasonal Series, Fort Collins: "Trek," HMSC; ... northwest (A/B), or west (C); ... "Ryan's Sports Grill". Meets on the south lawn of Ammons Hall, Colorado State University Welcome Center. B/■/Moderated pace and A/♦/Advanced pace 56-miler with 2600-vertical-feet. Eased pace/C/Green_Circle/● 12-miler with 260-vertical-feet. Free after-ride-brunch with pecan rolls from Silver Grill Cafe is to be hosted by Colorado State University at The Pavilion; paid-for by Colorado State University. (Colorado State) University Welcome Center, (Ammons Hall), 711 Oval Drive, south lawn. Free parking available after 4 PM, Colorado State University, Engineering Parking Lot. A south-southwesterly, clockwise loop: Ammons Hall, CSU; ... Mason Trail; ... Wabash Street; ... Spring Canyon Park; ... CSU.